It’s not fixed yet, either. PwC projects the rate of increase will continue in 2017: another 6.5% increase in healthcare costs nationwide. 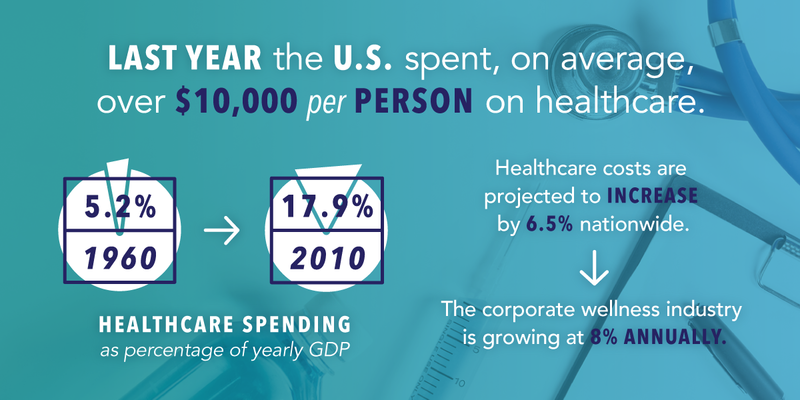 But, did you know the corporate wellness industry is growing even faster - at almost 8% annually? But, here’s the problem - “wellness” is just as broken as healthcare. Companies waved “wellness” like a magic wand over their P&L hoping the investment would provide a tangible return. They checked a box and walked away. “Wellness” was defined by an industry notorious for bureaucracy, paperwork, inefficiencies, and transparency problems. Their eyes were on dollar signs and silver bullets. Overnight, solutions sprang up: gamified mobile apps, reward programs, biometric screen services, wearables, and other services you could vaguely consider health-related. They all had one thing in common: their target audience was the healthcare industry, not the consumer. This has been the fatal flaw of the wellness industry for decades. Let’s be clear, Peerfit did not start off as a wellness company. Peerfit started as a way to help individual consumers connect more easily to the best tools the fitness industry had to offer. We believe businesses should only succeed if their customers succeed. In the wellness world that means a wellness company’s bottom line should grow or fall in direct proportion to their ability to get people to engage in healthy behaviors. Other programs don’t skimp on the cost. Companies are offering around $700 per employee for wellness incentives. These are usually doled out in gift cards for good behavior. Do a biometric screening? Here’s a $100 to Amazon. Take a smoking cessation class? Here’s a coupon for five free movies. It’s not that any one of these interventions is inherently wrong. It’s that there’s no cohesive vision. There’s no long-term benefit. It’s that “wellness” today just means checking a box on your employee benefits. In doing so, we’ve treated people like rats in a maze, surrounding them with cheese and traps and then wondering why they don’t go where we want. Social network members often play a key role in facilitating the health behaviors and treatment adherence critical to promoting health and managing disease through specific health-related interactions with one another” (e.g., Franks et al., 2006; Stephens et al., 2013). People don’t make decisions in isolation. We need to start thinking about how employees are impacted by their families, friends, and co-workers. Every person is infinitely complex, and we have to leave room for that complexity. Give people the attention and tools to find their own path to wellness. Listen, learn, and react. It’s not just about reducing healthcare, it’s about making people healthier, happier, and more productive in their lives. We’ve got to start playing nice with complementary technologies and programs. We may even be competitors, but if we focus on our core competencies and learn what “interoperability” actually means we can be better together. It will always be difficult to connect the dots between a dollar spent on “wellness” and a dollar saved on healthcare costs. But, if we shy away from data, we’ll be left with anecdotal evidence and good intentions. We may not like what the data has to say at first, but if we don’t stare it in the face then we can’t move forward. Ask yourself, what data actually shows me if we’re helping make this community of people more well? Here’s a hint, it won’t start with a lower insurance premium. This is our heartbeat at Peerfit. But, our hope is we won’t stand alone. Wellness isn’t a destination; it’s a journey we choose to walk every day. It’s an out of shape father getting up early for a spin class with his coworker because he wants to be there to meet his grandkids someday. It’s a busy professional who makes time for yoga with her friends because she’s found her success starts with taking care of herself. It’s young parents playing soccer with their kids on the weekends because they want to lead by example. I’m committing as President of Peerfit, along with our CEO, Ed Buckley, and the entire Peerfit team to fight this battle to redefine wellness. But, we know we don’t stand alone. There are amazing, forward-thinking companies out there who are doing it right. So, as of today… as of this moment, we’re officially launching the #RedefineWellness campaign. Follow us on social media and join the conversation. It’s not about us and it’s not about you. It’s about the millions of people who we can help together. So, what are you going to do to #RedefineWellness? Talk to you soon!